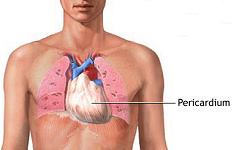 The pericardium is the envelope consisting of a membrane sac surrounding the heart. The commonest pericardial condition involves a viral inflammation (acute pericarditis). Inflammation of the pericardium can also occur due to other concomitant conditions such autoimmune conditions (e.g. SLE and rheumatoid arthritis). More chronic inflammation or infection causes the membranes to thicken. Eventually the membrane starts to contract, constricting the heart (constrictive pericarditis). In any inflammatory or infective cause, fluid may build up within the membranes (so called pericardial effusion). Most commonly due a preceding viral infection that inflames the pericardium. It is usually very benign and self limiting. This can cause symptoms of chest pain and possibly some shortness of breath. It is usually a sharp pain made worse by breathing in or sometimes by changes in posture (such as lying down or sitting up). The ECG may show some classical ST segment changes. If the inflammation also involves the adjoining heart muscle itself, it is called myo-pericarditis. This diagnosis is suggested by concomitant symptoms of palpitations, and a blood test showing spillage of a chemical called troponin. In younger patients, where the coronary artery disease is less likely, the diagnosis can be straightforward. However, as ECG changes and elevation in the troponins can occur, diagnostic difficulties may occur in distinguishing the condition from a partial heart attack. In some cases, additional tests (even in younger patients) are sometimes necessary in excluding a more serious condition. Most patients undergo an echocardiogram that may indicate recent inflammation evidenced by the presence of fluid around the heart (pericardial effusion). Treatment of pericarditis usually involves pain killers with aspirin like drugs such as brufen or indomethacin which helps damp down the inflammation. Most cases clear up within 2 weeks. Occasionally it can have recurrences in the short term that necessitate intermediate term prescription of anti-inflammatory drugs, or rarely steroids. In cases where diagnostic uncertainty remains as to whether this is pericarditis or coronary disease, then other investigations such as Cardiac CT or even angiography can be performed. This is when fluid builds up in the membrane sac of the pericardium, and is diagnosed by echocardiography. A small amount may naturally occur which helps lubricate the layers between the heart and adjoining lungs. Active inflammation either due to a virus, or body inflammation causes the fluid to accumulate. Usually this fluid collection is self limiting and treating the underlying cause results in it clearing up. Occasionally it can build up more significantly. Treating it with steroids may sometimes help, or the fluid may need to be drained with a needle (pericardiocentesis). By this technique the fluid can be analysed to determine the cause. For significantly large collections, more serious conditions such as cancer from the lung or tuberculosis need to be excluded. In this case chronic inflammation, due to any source causes the membranes to thicken and contract. Overtime this starts to compress the heart, and preventing the heart filling and contracting. It can be silent at first but progressive tiredness and shortness of breath may supervene. On of the main features will be the progressive accumulation of fluid in the legs and abdomen. The veins in the neck will appear engorged. The condition may be suggested by echocardiography, although the pericardium itself is not visualised by the technique. Echocardiography is important in excluding other differential causes. Invasive techniques involving cardiac catheterization may be employed to make the diagnosis by detail cardiac chamber pressure measurements. 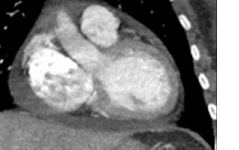 More recently, cardiac CT or cardiac MRI which are non-invasive techniques can visualize the pericardium directly. Management involves determining the underlying cause (such as tuberculosis or cancer). Treatment nearly involves surgery where the abnormal thickening is stripped away.